It would be easy for modern viewers to sneer at this early cinema tale of temperance and religion - on first viewing, I did just that. But repeated viewing pays off, revealing the clever ways the filmmaker has exploited the limited resources available in early cinema, to create a complex, yet coherent, tale with a message - in less than five minutes. Actually, multiple viewings are needed to fully grasp the story as well. Viewers at that time were likely already familiar with the tale, as it was derived from a well-known narrative that had appeared in other forms of entertainment. In addition, as with many early films, the film's visuals were likely supplemented by a lecturer - in this case, perhaps a member of a temperance society. But the achievement of this film lies in its self-sufficiency: even without the aids of familiarity or narration, a modern viewer can still not only follow the story, but be moved by it. 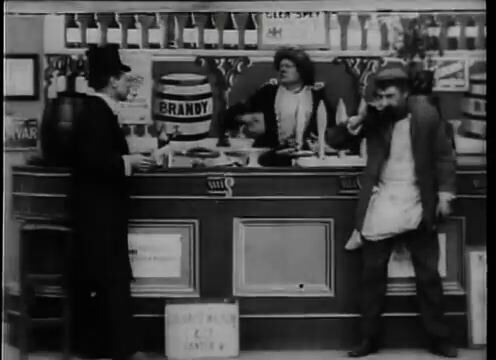 The film opens with a well-dressed gentleman at a drinking house. This is immediately contrasted when the protagonist enters: a rather slovenly working class man who bangs on the bar for attention. The two appear at opposite ends of the frame, highlighting the contrast between their appearances, as well as their manners. We understand from this that there are right and wrong ways to drink, and our protagonist clearly flunked Drinking Etiquette 101. When a man enters offering cherries for sale, the worker gets downright surly, while the gentleman graciously buys a box for the house (and wolfs them down without cleaning them - presumably gentlemen use their drinks as an antiseptic). Now the cherries seem more appealing to the worker, who helps himself to a bunch. This wins him a scolding from the barkeeper (who clearly won no honors in etiquette herself), most likely "Buy your own cherries! ", and a demand that his outstanding bill be settled. The worker pays and leaves in an empty-pocket huff. From here, the contrasts are in time, rather than space: his life before and after temperance. He is transformed from brutal to loving ways, from a squanderer to a provider, from a cherry moocher to someone who buys his own cherries. The barkeeper also undergoes a transformation: as the worker's fortune rises with temperance, the barkeeper's declines. First, the gentleman is shown politely but hurriedly declining her invitation to stop in for a drink. When she sees the worker, her rough edges are now softened, as she pleads with the worker to stop in for a drink. His brutal manners, however, have not completely transformed, as he shoves the aggressive barkeeper away, to buy his own cherries from the same seller he previously shooed away - and taunting the barkeeper with them. Temperance, however, teaches nothing about hygiene: he stuffs unwashed cherries, brought in from the streets, down his kid's gut - without even offering her a sanitizing swig of hooch. A real bummer for the kid's bum. If you don't want to be a bum, then buy your own cherries. But if you don't want to be a bum-bum bum, then you better grow your own cherries.